Warlimpirringa Tjapaltjarri was born on a hillside east of Kiwirrkura, near the West Australian Northern Territory border in the late 1950’s. He was the oldest of three brothers who came in from the Great Sandy Desert in 1984 along with several sisters and two old aunts. Until this time, at age 25, he had never encountered Europeans and their ways. The group had been following their traditional lifestyle in the country west of Lake Mackay and another brother Pierti, who had traveled with them, returned to the desert almost immediately thereafter. Having left his desert life behind because there were no elder men left amongst them, Warlimpirringa and his brothers began their initiation under the watchful guidance of Dr. George Tjapaltjarri, an Aboriginal ‘medicine man’ of high degree. 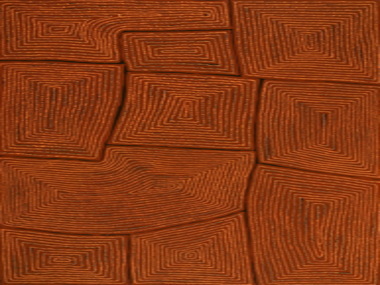 Read Warlimpirringa Tjapaltjarri artist insight.